Nowadays the name of Kanye West can be found on famous performers’ albums almost as often as the names of Timbaland and Lil Wayne as the tracks collaborated with him prove to be quite successful. The singer Estelle is one of the recent bright examples of that - the hit American Boy was one of the most popular this summer and still is rotated on the world’s radio stations. As for West’s solo creative work everything is almost faultless here, too, only the artist himself is not content with everything his ambitions requiring certain awards which for some reason he does not get. Nevertheless he has already three rather successful records behind and this year, right in time for Thanksgiving celebrations in the USA his fourth work 808’s & Heartbreak is released and it has quite a chance to make its creator’s dream of the best album statuette come true. The point is that 808’s & Heartbreak proves to be Kanye West’s most emotional and sincere album offering melodious and soulful compositions and, as is clear from the record title, of the broken heart topic. It is not long since Kanye parted ways with his fiancée Alexis Phifer and judging by all this breakup has hurt the singer so bad that one song about that just could not do it for him so he devoted practically the entire new album to the topic. The only exception is the song Coldest Winter dedicated to West’s late mother who died last year. 808’s & Heartbreak is also interesting for the fact that West provokes the audience again on it using the special equipment Auto-Tune that helps leveling the incorrect tune sounding to record absolutely all the tracks and instead of beats adopts the recordings of tribal drums. Surprisingly combined with Kanye’s great vocals these techniques do actually work. One of its brightest examples is the first single Love Lockdown with an expressive chorus on which a video is already shot featuring Kanye surrounded by the ghost of the past in the form of bellicose Indians. Welcome To Heartbreak is refined with a classic cello sounding and rapping from Kid Cudi while on Heartless the artist addresses directly to the girl that left him. A verse from Young Jeezy on Amazing combines splendidly with West’s sad singing and brutal backing vocals whereas a complicated ballad Street Lights is one of the album’s highlights due to wonderfully heartfelt singing and lyrics filled with despair and deep grief. Lil Wayne joins the artist on See You In My Knightmares, an example of how one can use the computer voice processing with a success. The album closes with a real surprise for the fans Pinocchio Story, a recording of West’s freestyling on a concert and the best way to demonstrate his incomparable talent. Kanye West has been always accompanied by scandals on his way to fame in fact doing nothing but attracting even more attention to his extraordinary person. Yet the artist has remained faithful to his beliefs in spite of everything continuing to cultivate his inimitable style. His fourth work proves to be the most demonstrative in this respect. 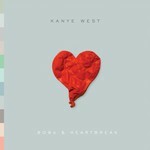 Unusual arrangements, unique drums and vivid collaborations are only the external attributes which still make 808’s & Heartbreak original and interesting. Besides although the same technique is used throughout the whole album the tracks do not result to be all the same and the album can by no means be called monotonous. As for the content it is Kanye West’s most personal and honest record on which he has expressed his most secret feelings associated with the people who are dearest to him. It is worth mentioning that the artist himself has never confessed to whom he has addressed most of the tracks on 808’s & Heartbreak even though no words are needed to understand it. Hopefully Kanye’s next creation will be inspired by some more pleasant events and prove to be no worse quality work than 808’s & Heartbreak.